To maintain the open feel of the park, the new Exposition Park Parking Structure is below grade, with the roof adjacent to ground level. The lower levels are open to nearby gardens and a landscaped areaway to allow natural ventilation and to eliminate the claustrophobic feel of subterranean parking structures. 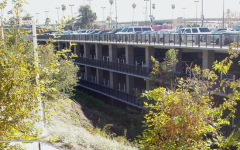 The architecture of the parking structure is deliberately low-key, so visitors will focus on the museums and gardens. 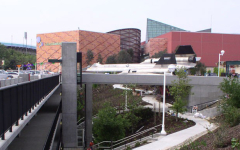 Exterior spandrels and walls are sandblasted, and cantilevered walkways run along the north side of the parking structure, with simple black steel guardrail allowing people inside the structure to see the gardens and museums beyond. To handle the peak vehicular flow generated by large events, the structure has two tunnels to allow entry/exit from three of the four levels simultaneously, allowing the entire structure to be filled or emptied in less than one hour.